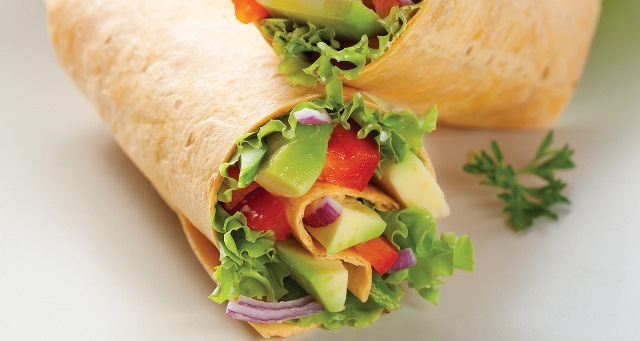 Wraps are a guaranteed win in any lunch box, not only because you can fill them with delicious fresh vegetables and proteins, but also because they’re easy to eat and the perfect portion size. The combinations are endless, but here is a recipe which is sure to become a family favourite! The chicken is a good source of lean protein – great for weight-loss – and the avocado and yoghurt supply good essential fats which provide nutrients and antioxidants to our bodies and minds. Don’t forget to choose whole wheat wraps! Cook chicken breast covered until golden. Let chicken cool then chop into bite-size chunks. In small bowl whisk yoghurt and lemon juice together until well mixed. Layer chopped chicken, red pepper, red onion, carrot sticks and mixed greens and coriander down centre of each tortilla. Pour yoghurt and lemon mixture down centre of each wrap. Roll up tortillas and serve.